In 2018, FGPC set a personal best for number of events produced—combined, almost 180 free programs and volunteer events, serving over 25,000 individuals. Reflecting on 2018’s successes, and the ways FGPC has grown in the last twelve months, we want to highlight some of the brightest moments, and the partnerships that made them possible. If any of the events or programs below meant something special to you this year, I hope you’ll consider making a year-end gift to support our work in 2019. This year, we offered a greater breadth of programs that engaged more diverse constituencies than ever before. Fan favorites returned—including Music in the Grove: Kids Concerts, Fort Greene Park Jazz Festival, Walt Whitman and Wallabout Walking Tours, weekly Tai Chi classes, and Yoga with Chelsea Piers—building on a tradition of high-quality arts and cultural programming. Many of these programs benefited from refinements and new features. We helped support the first-ever Fort Greene Park Spring Jazz Festival in April. Several new acts were featured as part of Music in the Grove, which brought the joy of Latin-American storytelling, hip hop, and West African music to the series. We also launched important new partnerships and programs. We co-produced our first-ever summer movie series with our friends at Rooftop Films, screening three incredible showings of Spike Lee’s She’s Gotta Have It, Pick of the Litter, and an assortment of short films from Sundance in June, July and August. We expanded our kids offerings with a new performance-workshop series produced with Cumbe, which showcased the beauty and rich dance traditions rooted in the African diaspora. These new collaborations highlight how fulfilling and varied the kinds of cultural experiences Fort Greene Park provides can be, and elevate important stories and perspectives that shape our community. All in, FGPC public programs served 22,850 individuals across seventy seven events. For 2019, we hope to expand new programs’ scope and reach, and ensure more members of our community have access to the benefits of free park programming. As Park Director David Barker emphasized in his recent letter, FGPC volunteers made key contributions to the health of Fort Greene Park’s landscape. Our volunteers helped steward the park’s 30-plus garden beds, keeping weeds at bay, and planting thousands of plants to support pollinators and prevent erosion. Together with David and his team, they’ve become a force to be reckoned with, winning city-wide accolades for the quality of their work. For the second year in a row, we’ve also enjoyed the partnership of NYC Service, the Mayor’s Office, and Americorps’ Civic Corps program, which has supplied FGPC with a dedicated team of volunteer managers. EY Volunteers helping on an erosion project along the Washington Park paths. Across our several programs—Saturday Spruce Ups, Friday Volunteer Corps, Service Learning Days, and Volunteer Gardeners—volunteers provide significant value to the park. We also benefited from the contribution of several corporate volunteer groups, including EY, Whole Foods Market 365, Apple Downtown Brooklyn, and National Grid. In 2018, more than 1,300 FGPC volunteers contributed over 3,700 hours of service during 109 individual work sessions. The value of their time and service is just over $60,000, the equivalent of what it would cost to pay for an individual full-time gardener or maintenance worker. The care and dedication our volunteers show is inspiring—Fort Greene Park wouldn’t be what it is without them. In 2019, we will continue to rely on their support as David and his team tackle perennial landscape management challenges and build on their success. One of the most exciting parts of 2018 was the advent of two incredible public art projects. We have continued to benefit as a part of NYC Parks’ Uniqlo Park Expressions program. This year, the plaza at Myrtle and Washington Park became the home of Adorn Me, a larger-than-life sculpture that celebrates the culture and histories of African Americans and African ancestry. It melds African spiritual tradition and Victorian/colonial methods of ornamentation in order to speak to changes in Fort Greene over the course of recent decades and demographics that have been historically underrepresented in public art. Acknowledging the rich African American heritage in our community, we worked hard with our partners at the Myrtle Avenue Revitalization Project to bring the piece to the park. Equally exciting was the launch of Community Heroes, a crowdsourced photography and storytelling project celebrating contributions of everyday neighbors—heroes—who organize for good in the places they live. The Fort Greene Park edition was particularly special. We announced and honored the first round of heroes at Monumental 2018 to fanfare and applause. Being able to publicly recognize teachers, partners, and leaders who make our park the place it is was a singular, special opportunity. The banners revealed at Monumental were installed along the park’s western edge over the summer. We’re still soliciting nominations for heroes, and the piece will continue to evolve as more honorees are announced and added. We know that public art can support dialogue across divides and cultivate a sense of shared identity. FGPC has been especially fortunate to work with artists committed to building community. In 2019, we will continue to exhibit new work that brings people and stories from all corners of our neighborhood together, some of which will help celebrate a certain Fort Greene resident’s upcoming 200th birthday. The growth in FGPC’s programs over the last twelve months has been driven and inspired by the incredible resources in our community. In our public programs, volunteer events, and public art initiatives, we know that authentic, intentional engagement is the key to success. In 2019, we plan to work harder than ever to ensure community feedback guides our program design, and draws in more people from more parts of our neighborhood than ever. There is so much beauty, talent, and expertise in Fort Greene—we’re glad our programs can draw on and celebrate those assets. If you have an idea of how we can improve, please take a short survey here, or reach out to me directly. Just like Walt Whitman did and so many other heroes have, we believe in Fort Greene Park’s potential to be a force for good in our community. 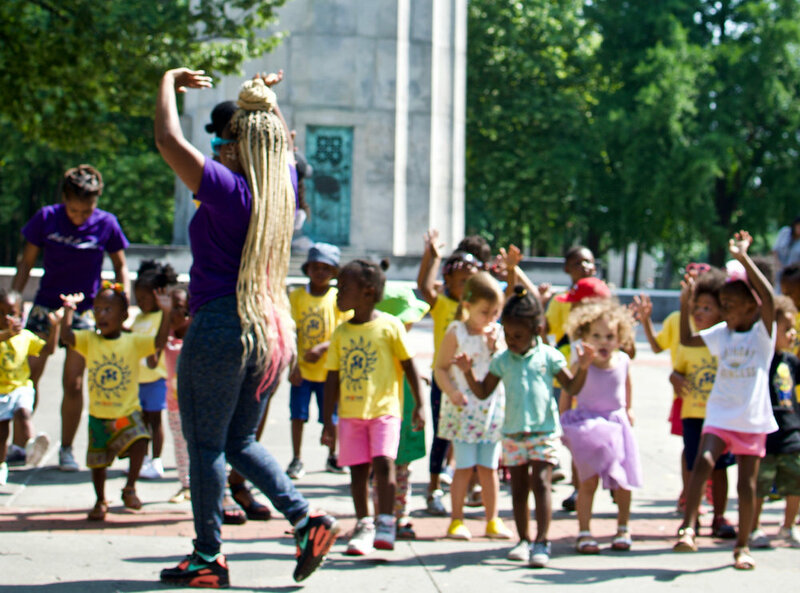 However, continued growth of programs that connect neighbors and create magic in Fort Greene’s bright, green heart can’t happen without your support. Before the end of the year, please consider making a gift or becoming a FGPC member to lend your (100% tax-deductible) support to ensure our 2019 programs can serve the neighbors they need to. In the meantime, we’ll see you in the park!